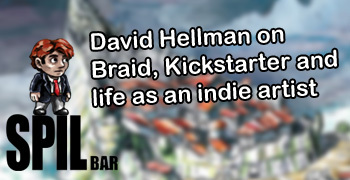 For the second installment of SpilBar in Viborg, we're proud to present David Hellman, who will talk about his work as the artist on Braid, the success that came with it, and how to stick to your guns as an indie artist. Participation in SpilBar is, as always, free of charge, and everyone are welcome, professionals, students and enthusiasts alike. There will be free beers, snacks, and an awesome chance to talk and meet new cool people! David Hellman is an artist working in comics, videogames and animation. He made the graphics for the videogame Braid, and before that, he drew a web comic called A Lesson Is Learned But The Damage Is Irreversible. 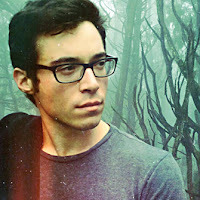 Most recently, David co-ran a successful Kickstarter to fund the creation of a comic book, Second Quest. After the unexpected, early career success of Braid, David spent several years looking for a suitable follow-up, living on his dwindling savings. With time running out, and no extra lives remaining, he chose to spend his last months of sustainable self-employment pitching a comic book called Second Quest. With writer Tevis Thompson, David committed to this new project in the most public way, with an appeal for funding on Kickstarter. In his talk, David will share observations about protecting his creativity in a career increasingly riddled with adult worries. This is where you can show the projects you're currently working on, share the good and bad experiences while making your projects, or just rant about something that bugs you. If you want to grab the mic, send us an email to emil@animwork.dk in advance so we can give you a timeslot to talk! Sign up via Facebook or Shareplay website.